June The Best Paper Award for the the 21st IEEE International Symposium on Real-Time Computing (ISORC 2018) went to the paper entitled “Data Freshness Over Engineering: Formulation and Results” by Dagaen Golomb, Deepak Gangadharan, Sanjian Chen, Oleg Sokolsky, and Insup Lee. Read more. February Insup Lee is part of the team of PRECISE researchers that received $6.1 Million grant from Office of Naval Research to reduce software complexity. Read more. December PRECISE and its Director Insup Lee are featured in Penn Engineering Magazine Fall 2017 Edition (pages 3-7). May Insup Lee is appointed as Co-Director of Penn Health-Tech (PHT). SEAS and SoM has launched a center called Penn Health-Tech (PHT), on May 2, 2017, which is co-directed by Brian Litt and Insup Lee with strong engagement by Mark Turco at PCI. April Insup Lee gave keynote talk Security of Cyber-Physical Systems: Challenges and Approaches at HotSoS on April 4, 2017. June Insup Lee delivered the keynote talk, Internet of Medical Things to Enable Medical Cyber-Physical Systems, at the 1st IEEE International Conference on Connected Health: Applications, Systems and Engineering Technologies, Washington DC, June 28, 2016. June Insup Lee was elected the Chair of ACM SIGBED, special interest group on embedded systems. SIGBED is a focal point within ACM for all aspects of embedded computing systems, including both software and hardware. April The Best Paper Award for the 5th International Conference on Cyber-Physical Systems (ICCPS 2014) went to the paper entitled "Robustness of Attack-resilient State Estimators" by Miroslav Pajic, James Weimer, Nicola Bezzo, Paulo Tabuada, Oleg Sokolsky, Insup Lee, George Pappas. December Insup Lee was appointed as a member of the NRC's Committee on 21st Century Cyber-Physical Systems Education. August Insup Lee received Appreciation Plaque from Ministry of Science, IT and Future Planning, South Korea, for speaking at Universal Linkage for Top Research Advisor (ULTRA) Program Forum. April Insup Lee served as a co-chair of CPS Week 2013. March Insup Lee gave a talk Assuring the Safety, Security, and Reliability of Medical-Device Cyber-Physical Systems as part of Wayne State University Department of Computer Science Distinguished Lecture Series. February Insup Lee gave a talk Assuring the Safety, Security, and Reliability of Medical-Device Cyber-Physical Systems (MDCPS) as part of Triangle Computer Science Distinguished Lecturer Series. More information available here. 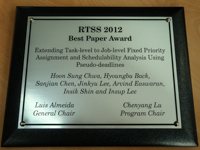 December The Best Paper Award for the 33rd IEEE Real-Time Systems Symposium (RTSS 2012) went to the paper entitled "Extending Task-level to Job-level Fixed Priority Assignment and Schedulability Analysis Using Pseudo-deadlines", jointly written by Penn and KAIST. 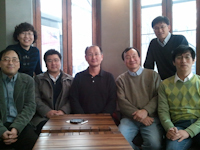 (Co-authors: Hoon Sung Chwa, Hyoungbu Back, Sanjian Chen, Jinkyu Lee, Arvind Easwaran, Insik Shin and Insup Lee). August Drs. Insup Lee (PI), Rahul Mangharam, Nathan Michael, George Pappas, Oleg Sokoslky, Stephanie Weirich (Penn) and Paulo Tabuada (UCLA) received a multidisciplinary grant of $4.8M from DARPA's High-Assurance Cyber Military Systems (HACMS) Program for "SPARCS: Synthesis of Platform-aware Attack-Resilient Control Systems"
June The Generic Infusion Pump project, led by Insup Lee, is featured in the article on open-source medical devices in the Economist magazine. May Distinguished Lecture "Challenges and Research Directions in Medical Cyber-Physical Systems" at DTC Science and Technology Innovators Series, University of Minnesota, May 1, 2012. More. April General Chair of ACM/IEEE Third International Conference on Cyber-Physical Systems (ICCPS 2012) held as part of CPS Week 2012, Beijing, China. More. April The Best Student Paper Award for the 18th IEEE Real-Time and Embedded Technology and Applications Symposium (RTAS 2012) went to Miroslav Pajic et al for their paper entitled "From Verification to Implementation: A Model Translation Tool and a Pacemaker Case Study" (Co-authors: Zhihao Jiang, Insup Lee, Oleg Sokolsky and Rahul Mangharam). October Measurement experiment by Andrew West and Insup Lee was highlighted by the article: "What Wikipedia Deletes, and Why", The Chronicle of Higher Education, Oct 26, 2011. September Doctoral student Andrew West won co-Best Paper at the 8th Annual Collaboration, Electronic messaging, Anti-Abuse and Spam Conference (CEAS 2011) in Perth, Australia, September 2011 for "Link Spamming Wikipedia for Profit", co-authored by Jian Chang, Krishna K. Venkatasubramanian, Oleg Sokolsky, and Insup Lee. June Invited talk Medical Cyber-Physical Systems at First European/US Workshop on Networked Monitoring & Control/Cyber-Physical Systems, Brussels, Belgium. May Plenary talk Cyber Physical Systems: 21st Century Embedded Systems at International Sympoisum on Embedded Technology (ISET), Jeju, Korea. More. May Invited talk Compositional scheduling and analysis techniques for real-time embedded systems at CPS Day @DGIST, Daegu, South Korea. May Member of Advisory Committee for Body Sensor Network Contest. April Program Chair of ACM/IEEE Second International Conference on Cyber-Physical Systems (ICCPS 2011) held as part of CPS Week 2011, Chicago, IL. More. December Co-organizer of 3rd Workshop on Compositional Theory and Technology for Real-Time Embedded Systems (CRTS 2010), San Diego, CA. December Distinguished Lecture Medical Cyber Physical Systems at the Department of Computer Science, Washington University as part of their Distinguished lecture series. November General Co-Chair, 1st International Conference on Runtime Verification (RV 2010), Malta. July Keynote talk Cyber Physical Systems: The Next Computing Revolution at ACACES International Summer School, La Mola, Spain. More. June Keynote talk Cyber Physical Systemsn at Cornerstone Ceremony, ADREAM, LAAS-CNRS, Toulouse, France. More. April GIP (General Infusion Pump) project is listed in the FDA infusion pump improvement initiative, April 23,2010. December Co-organizer of 2nd Workshop on Compositional Theory and Technology for Real-Time Embedded Systems (CRTS 2009), Washington, D.C.
December Banquet talk at the 30th IEEE Real-Time Systems Symposium (RTSS 2009), Washington, D.C.
April Co-organizer for Joint Workshop on High-Confidence Medical Devices, Software, and Systems (HCMDSS) and Medical Device Plug-and-Play (MD PnP) held as part of CPS Week 2011, San Fransisco, CA. More. June Member of Advisory Board for CPS Summer School, Georgia Institute of Technology. February Federal Strategic Plan for the Networking and Information Technology Research and Development Program. More. December IEEE TCRTS Outstanding Technical Achievement and Leadership Award. December Co-organizer of 1st Workshop on Compositional Theory and Technology for Real-Time Embedded Systems (CRTS 2008), Barcelona, Spain. November Workshop Co-Chair of Workshop on Software and Systems for Medical Devices and Services (SMDS 2008). September Founding member of PRECISE Center. August General Co-Chair of International Conference on Embedded and Real-Time Computing Systems and Applications (RTCSA 2008), Taipei, Taiwan. Copyright © 2011-2019 University of Pennsylvania. All Rights Reserved. Site designed by Academic Web Pages.